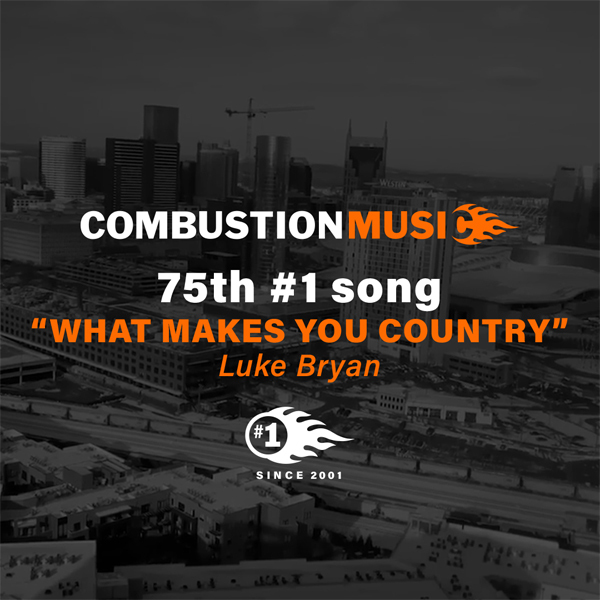 Combustion Music has simultaneous #1 singles with the multi-week Casting Crowns hit "Only Jesus", co-written with Matthew West and Luke Bryan's latest, "What Makes You Country", co-written with Ashley Gorley; marking #75 for Combustion Music. Currently, we have 11 singles climbing the charts: Chase Rice's "Eyes on You" at #14, Cody Johnson's "On My Way To You" at #16, Eli Young Band's "Love Ain't" at #17, Matthew West's "Mercy Is A Song" at #22, Lee Brice's "Rumor" at #23, Florida Georgia Line's "Talk You Out Of It" at #25, Chris Lane's "I Don't Know About You" at #41, and the recently announced "Floatin'" from Uncle Kracker and "Living" from Dierks Bentley. Head over to our Spotify On The Radio playlist to hear all of our current singles!